Since I've started writing this blog I've discovered so many other amazing blogs and bloggers. One of those people is Faith Gorsky who writes An Edible Mosaic. Faith's blog has recipes from all over the world but the ones that made me start reading Faith's blog were the Middle Eastern recipes. We love Middle Eastern cuisine and I am always searching for great recipes. Faith's new cookbook An Edible Mosaic: Middle Eastern Fare with Extra Ordinary Flair was published this week. It is available at Amazon and Barnes & Noble. For my Canadian readers it is available at Amazon.ca and Indigo. To celebrate Faith is having a Virtual Book Launch Party. The book has over 100 authentic Middle Eastern recipes, mostly from the Levant but also a few recipes from other parts of the Middle East. Faith was taught Middle Eastern cuisine by her mother-in-law, Sahar. Faith has simplified Middle Eastern cuisine to make it easy for everyone to cook. My husband has been asking me to try to make more Middle Eastern dishes so this book is perfect timing! In particular he wanted me to try to make a rice dish with raisins. A little while later I received an email from Faith regarding her Virtual Book Launch Party and this recipe...again perfect timing! 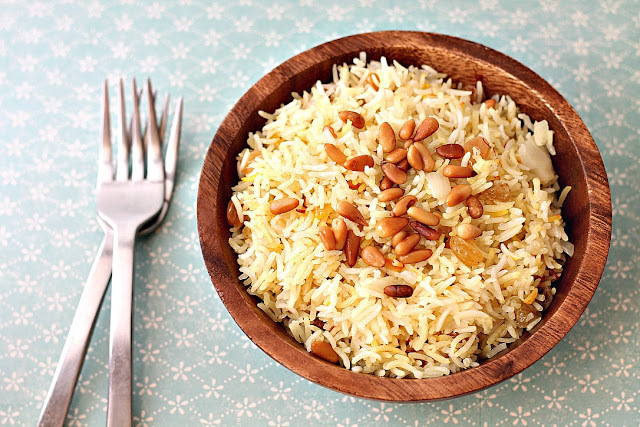 This rice dish was super simple to make and was delicious! At first we felt lost as to what to eat it with as raisins aren't an ingredient I use in my Indian cooking. In the end we preferred to have this rice with something simple that didn't have any overpowering spices. Such as some simple broiled fish or chicken. Please hop over to My Edible Mosaic to check out the Virtual Book Launch Party. Faith is also having a huge giveaway to please do drop by and enter! Thank you Faith for including me in your Virtual Book Launch Party. We loved this recipe and look forward to trying some more! Soak rice in tepid water for 10 minutes, drain. While the rice is soaking, put half a kettle of water on to boil. Add oil to a medium, thick-bottomed lidded saucepan over medium heat. Add the pine nuts and cook until golden brown, about 1 to 2 minutes, stirring constantly. Transfer the pine nuts to a small bowl and set aside. Add the onion to the saucepan you cooked the pine nuts in, and cook until softened and just starting to brown, about 5 to 7 minutes, stirring occasionally. Add the rice and cook 2 minutes, stirring frequently. Stir in sultanas, boiling water, salt, and saffron (or turmeric), turn the heat up to high, and bring to a boil. Transfer to a serving dish and sprinkle with the toasted pine nuts on top; serve. OPTIONAL: Add 4 pods of cardamom, two whole cloves, and one 2-inch (5 cm) piece of cinnamon stick at the same time you add the rice. Seeing everyone's posts makes me want to make this gorgeous rice all over again! Very beautiful looking rice and love all the ingredients used. Inspired by this post to leave you a comment. 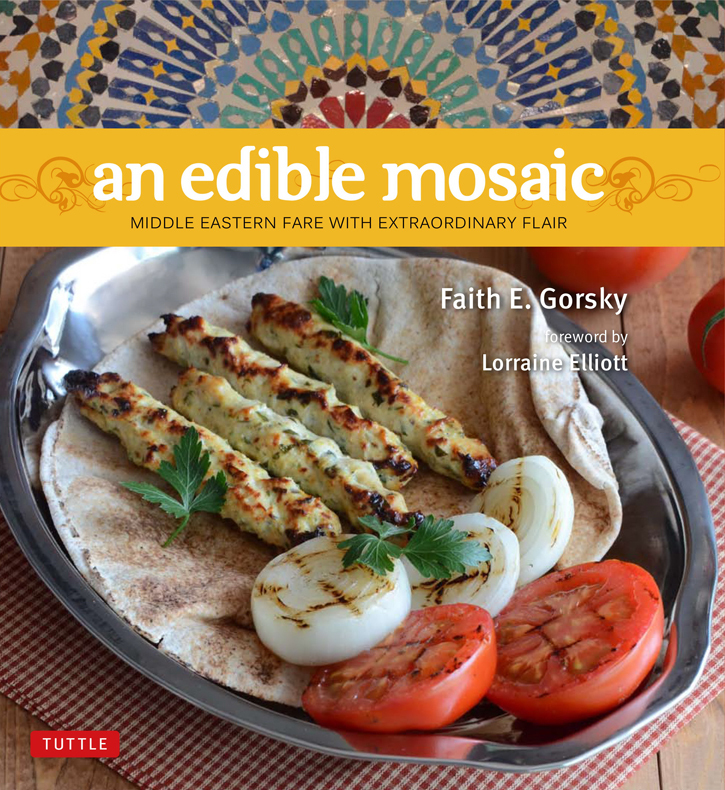 I absolutely love Middle eastern cuisine and Faith's book is sure to be a winner. Congrats to Faith and thank you for sharing with us! Asi, I'm gonna make fish for dinner on the weekend and this rice dish is a perfect addition!!!! Thanks for posting. I am s huge Middle eastern cuisine fan. Glad you shared this wonderful book launch with us. It looks gorgeous and I can't wait to try out the recipes. I think I have bowl envy! Love the wooden bowl you have the rice in... and the rice looks fabulous too. Nice to meet you through the Lunch Party! LOL!!!! I have been wanting a wooden bowl for awhile now and saw this in Winners a long time ago..finally got it last week :) Thx for stopping by....off to check out your post! Simple flavour. Toasted pine nuts add a really nice flavour to the rice. Your rice dish looks really nice and delicious. I also tried it but changed a little. I used pumpkin seeds instead of pine nuts because I didn't have pine nuts at home. Love it very much, especially with curry. Hope you have a great weekend. This rice looks too good! I need to make more interesting rice now! Wow, thanks for sharing the link and book suggestion (And the recipe of course). Can't wait to see more! What a beautiful way to serve rice. I'm so happy for Faith. It's definitely my kind of rice! I actually made this today. Served with grilled chicken. Didn't add the pine nuts b/c didn't have any and Ahmed's allergies. Turned out great! Thanks for posting this!!! Yeah!!! I find even without the raisins and pine nuts the rice is really good. I've seen people even using pumpkin seeds and almonds instead of the pine nuts. Pine nuts are insanely expensive...no idea why.